Force Gurkha to get a lot more POWERFUL than the Mahindra Thar; Thanks to Mercedes Benz! Force Motors’ Gurkha off-roader is the only lifestyle vehicle sold by the commercial vehicle giant. The Pune-based utility vehicle maker is all set to give the Gurkha a massive power and torque boost. The Gurkha will soon get the Mercedes Benz-derived OM611 turbocharged diesel engine, thus addressing one of the biggest concerns about the vehicle – its underpowered nature. The 2.2 litre-4 cylinder common rail turbocharged diesel motor will make 140 Bhp-320 Nm, a big boost over the 2.6 litre diesel engine’s 80 Bhp-230 Nm outputs. 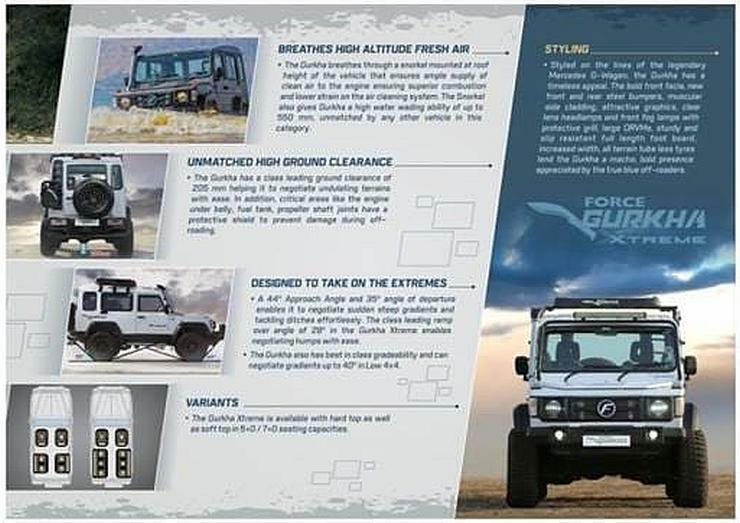 A new five speed manual gearbox, again from Mercedes Benz, and a dual mass flywheel equipped clutch will be offered on the more powerful Gurkha. A four wheel drive layout will be offered, with a manual shifter for the four wheel drive mode. Both low and high ratios will be offered on the four wheel drive transfer case. Other key changes on the Gurkha Xtreme has to do with the suspension. The off-roader will now get a multi-link suspension at the front and the rear, and this should make it much more comfortable for on-road use than the Mahindra Thar, which is quite bumpy thanks to its leaf spring suspension at the rear. The Gurkha Xtreme also gets a 40 mm wider track, and this should help reduce turning radius. Ground clearance continues unchanged at 205 mm, while water wading depth is rated at 550 mm. Yes, the Gurkha Xtreme will continue with a factory fitted snorkel. Brochure scans revealing the powerful new version of the Force Gurkha are already out. Dealers are said to be taking bookings for the new Gurkha, which is called the Xtreme. The Force Gurkha Xtreme will be the priciest of the Gurkhas sold in India. We expect it to sit above the Gurkha Expedition in terms of price and positioning, with an ex-showroom price of around Rs. 11 lakhs. 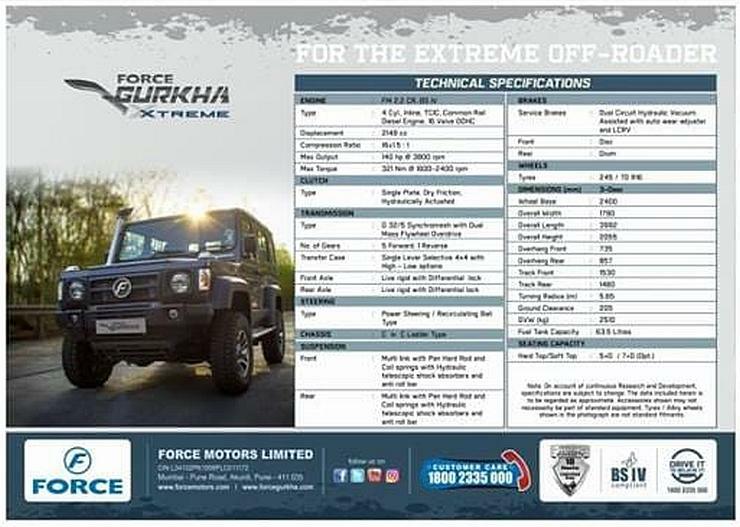 We expect Force Motors to sell the Gurkha Xtreme only in short wheelbase trim, capitalizing on the vehicle’s off-road ability. However, many enthusiasts will also want the off-roader with a longer wheelbase and additional seating in order to use it as an expedition vehicle.